If you're looking for a warm and fiery gemstone, you really can't beat the beauty of Ruby. Red is a colour of passion, love and anger, which means it is commonly associated with powerful objects. The fact that rubies feature this strong colour means that they have become one of the most significant stones in history, as well as one of the most popular in the modern world. Rubies have the highest value of all the coloured gemstones, with high quality and large stones sometimes fetching greater prices than diamonds. 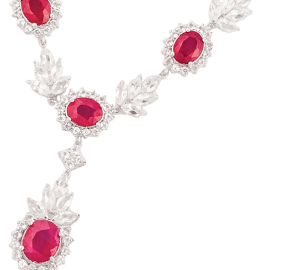 It is no wonder that rubies are so highly coveted. In ancient times, rubies were known as 'the king of gems', being called 'ratnaraj' in Sanskrit. They were thought to represent a huge number of things, including integrity, generosity, romance, prosperity and inspiration. It was also believed that rubies would bring valour and protection to those entering into battle, which is why many rich soldiers placed them on their armour, while legend has it, soldiers planted rubies under their skin to protect them when fighting. The stones are made of the red variety of corundum, which is one of the hardest minerals on earth. Sapphire is also a variety of this mineral, which means that it has similar properties to ruby. In fact, gemstones from the corundum family that are any colour but red are classed as sapphires, with only rubies being categorised as a different stone. The red aura of rubies means the stones look bigger than they actually are. This means that even small cut stones can look impressive. The Burmese Ruby is the rarest and the most expensive type of Ruby, holding a deep red hue with a blue tint, which is highly sought after. Rubies are also incredibly hard, meaning they are perfect for use in all types of jewellery as the red colour also creates a gorgeous warm look that suits either yellow or white metals. Rubies are just below diamond on the Mohs scale of hardness and are only just softer than sapphires, meaning they can withstand daily wear. Rubies are the birthstone for the month of July, as well as being the traditional gift for 15th and 40th wedding anniversaries. At TJC you'll find a gorgeous range of ruby jewellery at great prices, giving you the perfect excuse to splash out on the perfect pair of Ruby Earrings, a Burmese Ruby ring, bracelet or any other stunning jewellery pieces you just can’t live without.